Thanks to Editor Gwen, who got me a couple of tickets to the Tokyo City Cup races at Santa Anita this past Saturday, I drove out to Arcadia to take in the races. I’ve been to a couple of other Tokyo Cup events in the past, but it seemed like there were more “Japanese from Japan” at the event than in past years. Well, for one thing, they’re all speaking Japanese and they dress a little differently than we “Buddaheads” (Nisei) do. The other thing was that I didn’t bump into any Nisei during the day. Usually, I see a few dozen friends at the event. I guess the only one I know whom I did meet was Eddie Truman, who trains horses at the local tracks. He had a horse in the third race on the card. I got to know Eddie about 20 years ago when he was hired to train a horse owned by a Japanese from Japan who was a friend of mine and he asked me if I would act as the “owner” when he left the horse behind and returned to Japan. The horse, named Rex Ranger, ran in seven races before he was shipped to Japan for breeding purposes. Out of the seven races, Rex Ranger won one race, which was pretty good considering he raced at Santa Anita, Hollywood Park and Del Mar. It was a good experience for me, “owning” a race horse at a major track. Oh, by the way, I wasn’t aware of it, but the Rafu was listed as “media sponsor” for the Tokyo Cup races. That was the information printed in one of the booklets being passed out at the track. Perhaps that’s the reason why Editor Gwen had the passes she gave to me. Another bit of tidbit about Tokyo Cup day. I wonder how many of the visitors from Japan knew about the Japanese Americans being incarcerated at the track when it was labeled as an “assembly center” during the early period of World War II. My son, who helped me drive to the track Saturday, never saw the plaque placed at the track to tell the story of the assembly center, so he wanted to walk over to the area where it was situated. None of them seemed aware of the plaque, which sits atop a marble foundation. When they saw us reading the script atop the foundation, they kind of gave us a curious look. So, after we left, if they got up to see what we were looking at, they probably couldn’t understand the English on the plaque. Perhaps in one of the future Tokyo Cup races, the track and the sponsor of the event can include a story about the plaque and of the incarceration of the JAs during the war. I think the majority of the Japanese from Japan don’t know a thing about what happened to the JAs, so the Santa Anita track might reveal the story of the assembly center for the benefit of the visitors from Japan. In case some of the Nisei who were placed in camp at Santa Anita haven’t had the opportunity to see the plaque, I thought I would toss in a photo taken on the day the monument was dedicated. 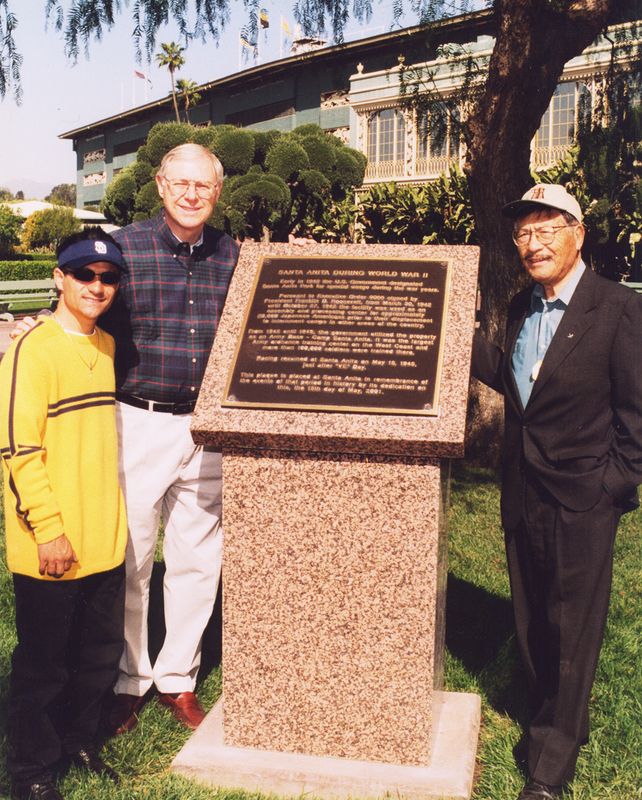 Posing in the photo with me are Supervisor Mike Antonovich, who used his political clout to get it placed, and Corey Nakatani, my favorite jockey. Oh yeah, I’m sure some of you are wondering how I did playing the horses at the Tokyo Cup day. Well, I bet on only two races and both of my bets ended up in the trash can. Another gift that was passed out to those attending the races was postcards with photos of Japan’s top jockey on each one, which made me wonder if any of the Japanese jockeys ever considered coming to the U.S. to ride. In all the years I’ve been going to the races, I’ve seen only one jockey from Japan riding at the local tracks, and that’s because he came over to ride a Japanese horse that raced at Santa Anita. Hey, if Japan’s top baseball players can come to the Majors and be successful, why not Japan’s top jockeys? They don’t have to know how to speak English and the horses don’t know the difference between English and Japanese. So what am I leading up to? It’s about the Army G.I. who shot and killed a large number of Afghanistan civilians recently. It was the top story in the media for several days. Then there is the case of Major Hasan, who shot up Fort Hood, Texas, while screaming “Allah Akbar” and still hasn’t stood trial. They are debating whether he was insane even with the clear evidence regarding his motive — slaying as many infidels as possible. In spite of this, none of the media are even comparing the two incidents. Execute a serviceman and let a real terrorist go scot free? I don’t play golf, but I’m a fan of the sport, which means I watch most of the tournaments aired on TV. Needless to say, most of you can guess whom I am a fan of. Yup. Good old Tiger Woods, which means I’m smiling today because Woods won this weekend’s tournament. “Tora” in Japanese is tiger and “mori” in Japanese is woods. This weekend’s win for Tora Mori was his first in a couple of years. Okay, so maybe I’ve been sitting in the sun too long. Well, that’s not possible because it’s been raining for the past few days. Oh well, life is like a roll of toilet paper. The closer to the end, the faster it goes. 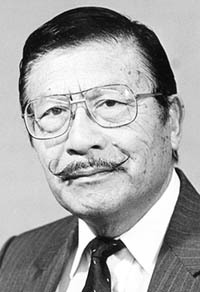 “I’m Sumi Shimatsu, who has been writing for the publication, ‘Crystal City Chatter’ for over 25 years, and I just thought you’d like to know that my father was one of the pioneers of the Japanese community in Los Angeles, along with Mr. Kusayanagi. They both were in the original Japanese Town on Main Street, but had to move when City Hall was built in 1928. “He came to Vancouver in 1888 and worked at a shipyard building ships for a few years. He then worked his way down the coast doing work on the railroad, farm and finally came to Los Angeles. “He worked as a janitor for Belasco Theater and the owner liked him and gave him a camera and told him to try it out. My father liked it so much he went to photography school and soon became the photographer for Belasco Theater. He was soon having his photographs in local newspapers and became the publicity photographer for the theater. “He opened a photography studio on Main Street but had to move when the City Hall was built between San Pedro and Weller Street. “I was born in 1928, so I am the same age as the City Hall. My father was at 244-1/2 East First St., upstairs. Below was Mikawaya, with Mrs. Hashimoto. My two sisters knew Tak Hamano of Umeya and his cousin Noboru, and we all grew up in Little Tokyo. “Just before the war, my two sisters went to visit my grandfather in Sendai and were caught there when Pearl Harbor was bombed and World War II began. “My father was arrested by the FBI and my mother and I were sent to Pomona Assembly Center, then to Heart Mountain. I was 16 at the time and I was very angry for having been separated from my father. “During the year my mother and I were at Heart Mountain, our neighbor was Michi Onuma, who worked at The Sentinel, the camp newspaper. She was from San Francisco and worked at the Shinshin Shinbun, Hokubei Mainichi and the other San Francisco Japanese newspapers. “In the summer of 1943, my father chose to repatriate to Japan to be with my sisters and get his family all together. So, my mother and I went to New Jersey Harbor to get on the Gripsholm ship. But 97 were denied boarding because the vessel was overloaded. “So, we were sent to Crystal City family internment camp in Texas with five other families, and the rest of those denied boarding on the ship all were sent to Tule Lake. “Heart Mountain was only a mess hall and communal life. I was in Block 14 and the cook just cooked everything like stew or goulash. We called it ‘gottani.’ I went to Block 12, where Mr. Kida of San Kow Low was the cook. We enjoyed better food there. “Being a youngster, I was told I could not eat at these other mess halls. My mother and I used to gather young dandelion weed to make tsukemono and put it on hot rice at the mess hall, which made our food edible. “Crystal City did not have a mess hall. We were given a kerosene stove and oven to cook on and our mothers went shopping with original shopping carts made from crates and wooden wheels. There was a market and grocery store, so it was wonderful. We had ice delivered every other day along with fresh milk. “There were Japanese from Alaska, Hawaii, Peru and Germans and a few Italians. Life was a great improvement compared to the internment camp. “Our mail was censored and all magazine and comic books were confiscated, but it was much nicer than Heart Mountain. Thanks to Sumi for her story. There is a lot of information in the story that I learned about for the first time. I’m sure a lot of the readers will say the same. “Ah, you have chosen wisely. It is $12 for the rat and $100 for the story,” said the wise old Chinese man. As he walked down the street carrying his bronze rat, the tourist noticed that a few real rats had crawled out of the alleys and sewers and began following him down the street. This was a bit disconcerting, so he began to walk faster. A couple of blocks later he looked behind him and saw to his horror the herd of rats behind him had grown to hundreds and they began squealing. Sweating now, the tourist began to trot toward San Francisco Bay. After a couple of blocks, he looked around only to discover that the rats now numbered in the millions and were squealing and coming toward him faster and faster.